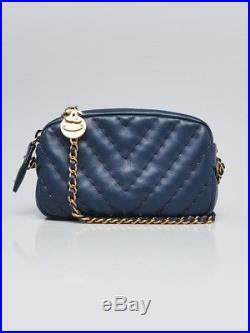 Chanel Blue Chevron Quilted Leather Mini Camera Case Bag. Go glam with this gorgeous Spring 2012 Chanel Blue Quilted Chevron Leather Mini Camera Case Bag in this stunning blue/purple color. It is made of lovely and durable chevron quilted calfskin and features goldtone hardware with 31 Rue Cambon stamping and a small, dangling CC logo. This versatile bag is perfect for everyday use or for a night out on the town. An elegant and timeless piece to add to any collection. The exterior leather remains clean and beautiful throughout with minor signs of wear to the bottom corner edges. The bag has a faint stain on one side. The hardware remains bright and clean. The interior lining is clean and overall in great condition. Includes: Dust bag (authenticity card is missing). Material: Blue Chevron quilted leather. Handles: Single leather and chain entwined long strap. Interior Lining: Fine textile lining. Measurements: 6.5" L x 2" W x 4.25 H. Only 100% authentic bags earn the tag! We're experts in distinguishing the "wanna-bes" from the real deal. Whether it's a handbag or necklace, determining the authenticity of an item is a mix of art and science. Lastly, the item is compared to on-hand authentic reference items. We guarantee the authenticity and condition of each item we sell. All we ask is that you do not remove the Authenticity Seal attached to your item and that you return the item in the condition you received it. We cannot accept return items that do not meet this criteria. We know that shopping for new luxury goods at high-end retailers can be a luxurious and satisfying experience. We strive to deliver the same high quality experience and level of service for pre-owned goods. Never considered giving a pre-owned luxury item as a gift? Every order is presented and packaged to standards that match or exceed luxury retail stores and therefore make great gifts especially if it's a gift for yourself! For every order, take a look at what comes in the box. Professionally cleaned and rejuvenated luxury item with "Guaranteed Authentic by Yoogi's Closet" hang tag and seal. "Guaranteed Authentic by Yoogi's Closet" enclosure card. Care instructions and message from Yoogi. Original box, dustbag, and enclosed materials. Note that select pre-owned merchandise will arrive with these items. Please refer to the product description page on the Yoogi's Closet website for details. Have Authentic Luxury Handbags or Jewelry to Sell? We pay top dollar for quality, gently used luxury handbags. The item "Chanel Blue Chevron Quilted Leather Mini Camera Case Bag" is in sale since Wednesday, August 29, 2018. This item is in the category "Clothing, Shoes & Accessories\Women's Bags & Handbags". The seller is "yoogiscloset" and is located in Seattle, Washington.